October 20 at Aloe St.
October 20 at 2nd Ave.
October 22 at S. New York Rd. October 26 at Coolidge & Fir Ave.
Fransico Fabian-Rondon, 42, of Galloway was arrested by Ofc. Christian Magazzu for DWI on October 20. Anthony A Cosenza III, 27, and Kevin J Luby,21, of Little Egg Harbor were arrested by Ofc. Ronald Gorneau for possession of CDS and possession of drug paraphernalia on October 20. Brandon L. Rivera, 28, of Galloway was arrested by Ofc. Ray Casanova for criminal mischief and assault on October 20 and by Ofc. Hiram Melendez for possession of CDS and theft on October 24. Andrew Smiley, 29, of Atlantic City was arrested by Ofc. Christian Magazzu for hindering apprehension on October 20. Craig A. Connolly, 45, of Manahawkin was arrested by Ofc. Dan Weigle for DWI on October 21. Jonathan F. Ortiz, 26, of Mullica was arrested by Det. Jason Kiamos for robbery, possession of a weapon for unlawful purpose and other weapons on October 23. Edward Smith, 44, of Galloway was arrested by Det. Sgt. Donna Higbee for theft, obstructing the investigation of a crime and receiving stolen property on October 23. Edward H. Campbell, 61, of Voorhees was arrested by Ofc. James Mullholland for DWI on October 26. April L. Gaupp, 24, of Galloway was arrested by Ofc. Gary Brenner for possession of less than 50 grams of marijuana and drug paraphernalia on October 26. Lora Dinunzi, 30, of Galloway was arrested by Ofc. Christian Magazzu for DWI, possession of less than 50 grams of marijuana and possession of drug paraphernalia on October 26. Tekisha Jonnel Matahis, 26, of GA was arrested by Ofc. Gary Brenner for aggravated assault on October 26. Patricia Pendleton, 47, of Galloway was arrested by Ofc. Rita Abatemarco for resisting arrest on October 26. 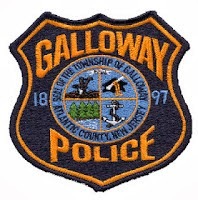 A 17 year old male of Galloway was charged on October 26 by Ofc. Kevin Welsh for aggravated assault, resisting arrest, theft, burglary, and assault to a K-9 officer on October 26.